A comment by one of Ross Gelbspan’s Facebook Friends is one of those things I have to add to the “Can’t make this stuff up” category here. Philip Shabecoff I think the time has come to bring charges of crimes against humanity against trump, his satraps, Exxon, all all the others in power who profess not to believe in climate change and who are blocking meaningful action to spare us and our posterity from the worst disasters that inevitably will come. Christy George I’ll join your suit Phil! Phil who? The Phil Shabecoff who I describe as one of the pushers (#6 on the list at my blog post here) of the “core evidence” that supposedly indicts skeptic climate scientists of participating in a sinister pay-for-performance plot where all parties are accused of creating and spreading lies to the public which misdirects people away from comprehending the certainty of catastrophic man-caused global warming. The same Shabecoff who I detailed toward the end of this post. 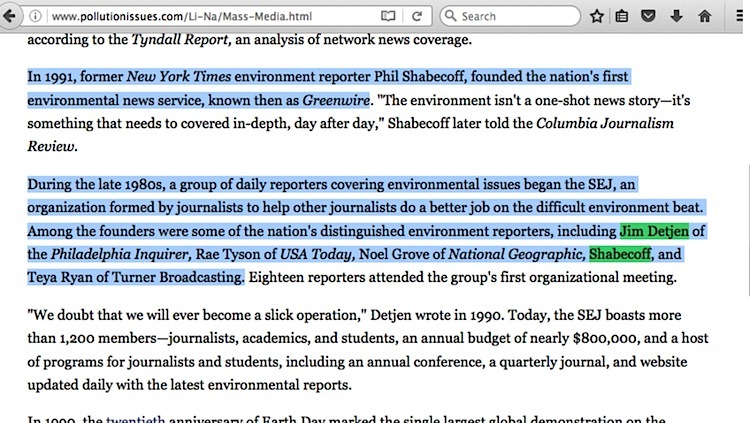 The same Shabecoff who is also described here (full text here) as being one of the founding members of the Society of Environmental Journalists, a place I argue is one of the earliest promulgators of the notion that skeptic climate scientists do not deserve fair media balance. Hence the politically suicidal enthusiastic comment of SEJ’s Christy George. 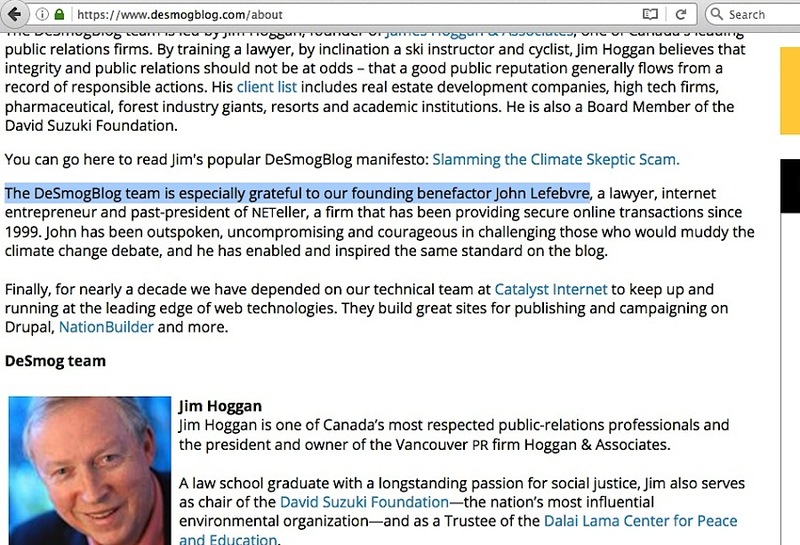 One other item, another of the commenter Friends at Gelbspan’s Facebook post is Desmogblog financier John Lefebvre, the person owning the private jet that Desmogblog co-founder James Hoggan was flying on when he declared – as I detailed here – that he (Hoggan) knew nothing about climate change but felt compelled to start Desmogblog in order to expose skeptic climate scientists, which he knew to be liars as a result of reading Gelbspan’s 2004 “Boiling Point” book. 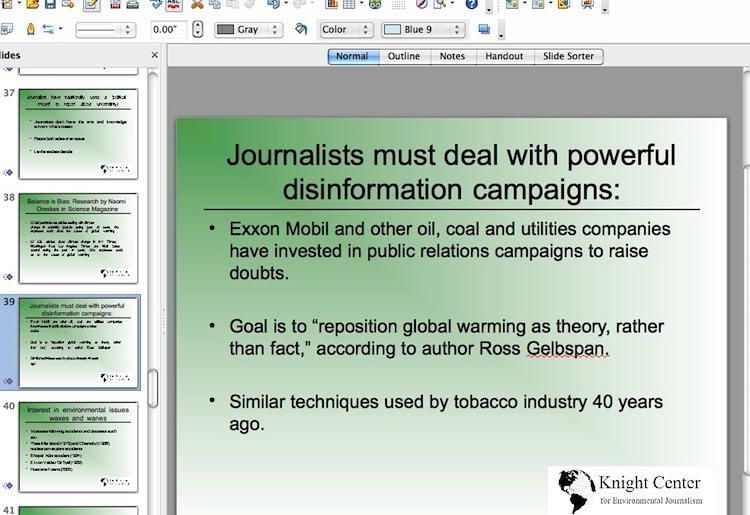 Gelbspan, lest anyone forget, is also not a climate expert. 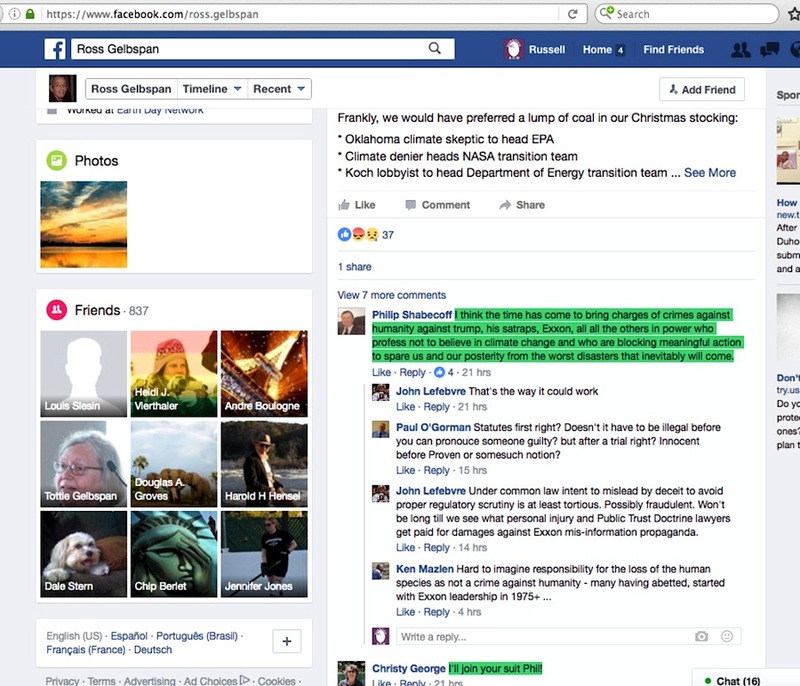 In the face of Donald Trump’s cabinet nomination of Scott Pruitt, an AG who was part of the backlash against the racketeering persecution of ‘climate deniers’, is Shabecoff actually blissfully unaware that in the legal action he’s demanding, the accusation would be cross examined in order to determine whether people accused of denying climate change and deliberately spreading lies and misinformation for the purpose of criminally blocking meaningful action … actually undertook exactly that action?? 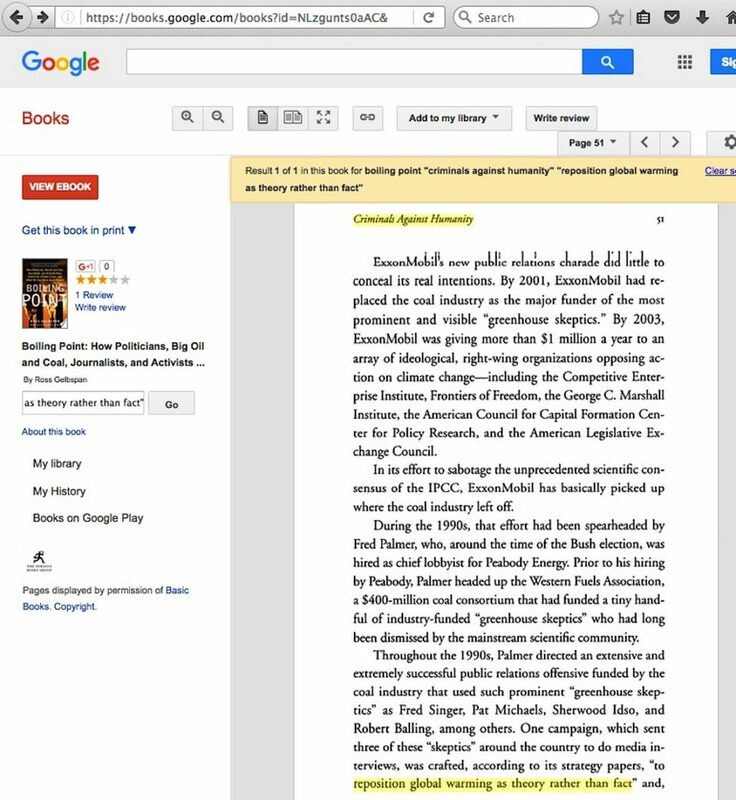 And that enviro-activists’ collective accusation against skeptic climate scientists might backfire under tough scrutiny, potentially exposing them – Shabecoff, Gelbspan, Naomi Oreskes, “Greenpeace USA née Ozone Action,” and Al Gore – as people engaging in the kind of racketeering action they claim is being done by the fossil fuel companies? Where perhaps not even the finest lawyers bought by Tom Steyer / George Soros money could hide this revelation from the public? Or is he desperately trying to keep a particular talking point afloat, in an act of apparent death wish false bravado? This entry was posted in accusation repetition, Can't make this stuff up, Three degrees of Separation or Less and tagged Phil Shabecoff by Russell Cook. Bookmark the permalink.